Top Ten Tuesday is a weekly meme that currently resides at The Artsy Reader Girl and features bloggers sharing lists on various book topics. 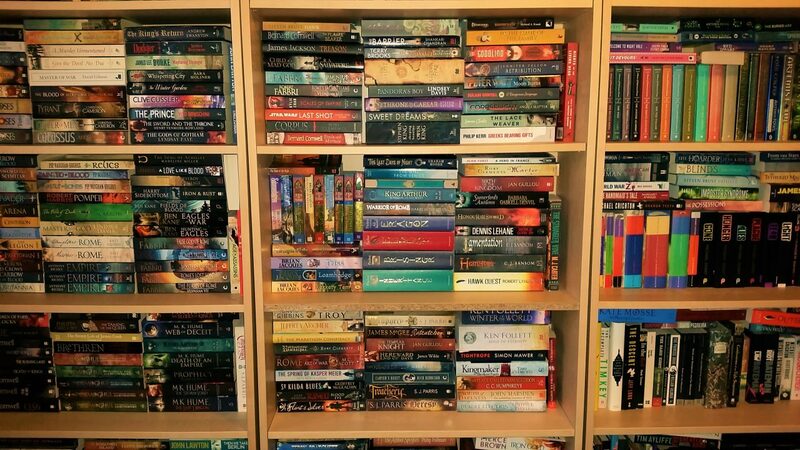 A couple of days ago I noticed the latest edition of Top Ten Tuesday on one of the blogs that I follow and it really got me thinking about what books from last year I wish I had read. Unfortunately, I am arriving at this topic a bit late in the game, so my Top Ten list is a week later than everyone else participating in this meme, but I am still going to go ahead with it. I’m planning to participate in a few more of these in the future because some of those topics sound like fun. The challenge from last week was to list the top ten books I did not get a chance to read in 2018 that I wish I had been able to check out. While there are a ton of amazing novels that I wanted to check out last year, these are easily the top ones that I should have made the time to read. I have to admit this is a rather eclectic mixture of books, but something about each of these spoke to me in some way, and I did make some effort to read this last year. I will probably try and read these books in the future, especially if they are part of a series or sound particularly amazing, so keep an eye out for these books in my Throwback Thursday series of reviews. There are a few 2018 releases that I am excluding from this list. This is mostly because they are late 2018 releases that I will hopefully get a chance to read or review in the next month. These books include The Winter Road by Adrian Selby, Empress of all Seasons by Emiko Jean or Lies Sleeping by Ben Aaronovitch. I have also decided to exclude a few big sequels or later instalments of a series from this list. It is not that I do not want to read these books, it is just that I intend to read the earlier books in the series first in order to get the full benefit of these books. For that reason, I have not included books like Kingdom of Ash by Sarah J. Maas, Vengeful by V. E. Schwab or Grey Sister by Mark Lawrence. I am a big fan of Charles Soule’s comics, so not only was I intrigued by this absolutely awesome-sounding story but I was also curious to see what his novels would be like. Unfortunately, I was unable to get a copy of The Oracle Year, so I did not get a chance to read it when it was released. I am still really keen to check it out, but for this one in particular I am thinking of listening to the audiobook version of this book, as I imagine this will enhance what promises to be a rather amusing story. Steven Hartov captures the turbulent emotional rush of those caught behind the lines of occupied France, where one false step could spell death and every day brings a new struggle to survive. The second book on this list was probably the historical fiction book I most regret not getting in 2018. There are some great pieces of heist fiction set during World War II, and one told from the perspective of a German solider, especially one who might have conflicting loyalties with the Nazis, sounds like it would have a lot of potential. Neither the Polity or the prador want the other in full control of the disc, so they’ve placed an impartial third party in charge of the weapons platform guarding the technology from escaping into the galaxy: Orlandine, a part-human, part-AI haiman. She’s assisted by Dragon, a mysterious, spaceship-sized alien entity who has long been suspicious of Jain technology and who suspects the disc is a trap lying-in-wait. Meanwhile, the android Angel is planning an attack on the Polity, and is searching for a terrible weapon to carry out his plans – a Jain super-soldier. But what exactly the super-soldier is, and what it could be used for if it fell into the wrong hands, will bring Angel and Orlandine’s missions to a head in a way that could forever change the balance of power in the Polity universe. Another one I was not able to get a copy of, although I do remember eyeing it off in a book store. I have heard really good things about Neal Asher before and this sounded like it would be an intriguing introduction into an exciting new science fiction universe. With a sequel to The Soldier coming out in May, I may have to move this book up my reading list and enjoy it in the next couple of months. Aren has lived by the rules all his life. He’s never questioned it; that’s just the way things are. But then his father is executed for treason, and he and his best friend Cade are thrown into a prison mine, doomed to work until they drop. Unless they can somehow break free . .
For some reason I had no idea that The Ember Blade was even coming out last year until I saw it in the bookstores, and by then I had so much else going on I was unable to fit it into my reading schedule. This always struck me as a darn shame, as the synopsis sounds extremely epic and I always love travelling into new and impressive fantasy worlds. To be honest, the main reason I have not managed to get around to reading it since its release is because of its length. At over 800 pages long, or 30-plus hours in its audiobook format, this is a massive reading commitment for me. However, I know that I will be able to make some time for this book at some point this year, and I am looking forward to when I get a chance to check out this book. This is another that I have currently sitting at home, cluttering up my coffee table. The plot of The Deathless always struck me as being particularly unique out of all the books from last year, and I was really keen to dive into this curious sounding universe. Newman has a sequel to this book coming out in June, so I will have to try and read it by then. Dark State is the second book in an exciting series in the same world as Charles Stross’ Merchant Princes series, following Empire Games. I was sorry to not get a chance to read Dark State because I really enjoyed the prior book in the series Empire Games in 2017. I loved the concept of two alternate timelines getting into a conflict with each other, and I loved reading about the espionage that would result in this situation. I am definitely going to read Dark State in 2019, as the third book in the Empire Games series is coming out in November. I have not had the pleasure of checking out Cameron’s fantasy work before, but I have read a few of his historical fiction books that he writes as Christian Cameron. As a result, I am curious to see what his fantasy writing is like, and this new series seemed like the perfect opportunity. Cold Iron’s story sounds like it could be a lot of fun, and I like how Cameron is apparently focusing on a protagonist who is not a ‘chosen one’ but just some random person off the street. I might be reading this book very soon, as the second book in this series, Dark Forge, has just been released, and I would prefer to have read Cold Iron before I try and get a copy of it. What would a list on my blog be without a tie-in novel? I am not the biggest Star Trek fan out there, but I did really enjoy Star Trek Discovery last year and I have been thinking about checking out some of the associated tie-in novels. Out of all of them, Drastic Measures struck me as sounding particularly outstanding, as not only does it focus on two of the show’s best supporting characters (both played by exceptional actors), but it also ties into one of the most serious episodes of the original Star Trek series. This has been on my to-read list (and my bookshelf) for nearly a year now, and I hope I eventually get around to reading it. To be honest, I am still surprised that I have not read this book yet. I really enjoyed Barker’s previous two books, Age of Assassins and Blood of Assassins, and I fully intended to read this book when it was released. Unfortunately, fitting it into my reading schedule has somehow proven to be impossible, and the copy I have at home keeps giving me hurt looks from my coffee table. It does not help that every fantasy reviewer I follow has been talking this book up like crazy, and the general consensus is that King of Assassins is apparently better than the first two books in the series, both of which were already pretty awesome. I really want to see how this series ends, so I think I might grab this version on audiobook and check it out in the next month or so. This has to be one of the books of 2018 that I most regret not reading. I did get a copy of it but I did not get a chance to read it because of other review commitments that I made. I am still extremely curious to find out how the suspect could be in two places at once and I really want to find out how this mystery ends. Luckily, I have managed to avoid any spoilers about it and I hope to check it out in the next few months. From debuting author Gareth Hanrahan comes the grimdark fantasy book that everyone has been talking about, The Gutter Prayer. This debut novel has been getting some serious hype from a lot of fantasy reviewers, so I was very happy when I got my copy earlier in the week, as it will give me a chance to check it out for myself. For thousands of years, the large, sprawling city of Guerdon has survived against all manner of attacks and calamity. In recent years, the city’s alchemical industry has taken off, producing powerful weapons and twisted creations to sell to Guerdon’s warring neighbours, involved in the destructive Godswar. But with the rival nation’s eyes on Guerdon, refugees flooding into the city and the city’s various factions fighting for power, the potential for chaos is great. In the middle of all this, three mismatched young thieves – stranger to the city, Cari; the Stone Man, Spar; and Rat the ghoul – find their lives changed forever. Hired by the leader of the city’s criminal element, these three thieves attempt to break into an important civic building, only to be nearly killed by a massive explosion and framed for the crime. Pursued by the Alchemist Guild’s murderous enforcers, the Tallowmen, and the relentless thief-taker, Jere, the three friends attempt to escape their pursuers, but find themselves entangled in a terrible plot to bring destruction to the city. Ancient creatures are rising from the city’s bloody past, and the city’s old gods are prepared to rise once again. As Cari, Spar and Rat uncover the full extent of these gods’ power, they must contend with others who seek to use the chaos for their own ends. With everything on the line, can the three friends find a way to stop the events unfolding, or will their failure result in the destruction of everything they hold dear? This is Hanrahan’s first fictional book, although the author has written a number of gaming manuals and fantasy guides over the years. However, with the evident popularity of The Gutter Prayer among the fantasy community, it seems extremely likely that this will not be Hanrahan’s only book. Indeed, the author already has plans for a sequel, and The Gutter Prayer will form part of this planned Black Iron Legacy series. I thought that The Gutter Prayer was an ambitious and intriguing new entry to the fantasy genre, and it is definitely worthy of the hype around it. Hanrahan presents a wide-ranging and dark story of magic, religion and betrayal, and he sets it within an imaginative new fantasy landscape with a ton of unique fantasy elements and creatures. The story is then based around several great characters, each of whom has their own compelling arc within the narrative. The result is an excellent and memorable novel that showcases Hanrahan’s creativity and serves as an amazing introduction into a bold new fantasy universe. This book contained a fantastic and intense story which focused on a variety of different characters and follows their attempts to investigate and forestall the strange events occurring around them. I really enjoyed this story, although I had a little bit of a hard time getting into it at the start of the book due to mass of story and fantasy elements I was bombarded with. However, I am extremely glad that I powered past this first part of the book because once I was able to place all the story elements together I appreciated the book’s wild and intricate plot. One of the main things that I really loved about this book was the inclusion of a significant number of different characters and factions, each with their own motivations and hidden secrets. As a result, you have no idea who is going to do what next and who is going to betray the protagonists to serve their own needs, creating an unpredictable story. The narrative is also extremely dark, and readers should be prepared for characters dying or being altered in some way or another. This is some fantastic storytelling from Hanrahan, and an overall clever narrative. One of the most talked-about elements of this book is the author’s use of a huge range of unique fantasy elements. Hanrahan has come up with and expertly utilised a ton of creative, inventive and at times just plain creepy new fantasy elements. The best example of this has to be the Tallowmen, humans that have been turned into living candles, often as punishment for crimes. These creatures are strong, lethal and fast, serving as the guards and law enforcers of the Alchemist Guild. Their terrifying appearance, distinctive abilities and the glow of their candle flames as they hunt down the protagonists are extremely memorable. Another terrifying inclusion is the Ravellers, servants of the city’s ancient gods who have the ability to unravel people out of existence and take on their appearance. There are also the ghouls and Stone Men. Stone Men are humans infected with a disease that slowly turns them into stone, although their condition can be held back by an alchemical compound. The depictions of their condition are pretty horrific, and there is the interesting double-edged sword of the disease: they become stronger the more their condition progresses, but they also become less able to live normal lives. The ghouls, humanoid creatures who feast of the dead flesh of humans, are an element that most fantasy fans will be familiar with, but Hanrahan has made some clever alterations to these creatures by expanding on their life cycle and making them a key part of the city’s history. Another awesome creation is the Crawling Ones, a sentient hive of worms who take a human shape and are powerful magic users. In addition to the above unique fantasy creatures, The Gutter Prayer also introduces the author’s great new twist on fantasy gods. The world of the Dark Iron Legacy is filled with a vast pantheon of powerful gods, which forms a critical part of this universe. Many of the deities outside of the city are engaged in a massive conflict known as the Godswar, where these gods and their followers are involved in battles against each other for supremacy. While we get a brief look at this in The Gutter Prayer, most of the focus of this book is on the gods of Guerdon. While a few other religions are mentioned within the city, the main two pantheons are the Kept Gods and the Black Iron Gods. Both of these different gods are extremely intriguing, and I particularly loved the concept of the Kept Gods, who are chained and whose intake of prayer is controlled by their church to limit their power and control their actions. The Black Iron Gods are a darker and more ancient pantheon with a great history, a horde of sinister followers and a captivating physical presence. I also liked this universe’s concept of saints, those humans gifted power by their connection to the gods. There are a couple of saints featured throughout the book who form an integral part of the plot, powering through the story with a range of different powers and abilities. Quite frankly, all of these unique fantasy elements are deeply intriguing, and Hanrahan uses all of them perfectly to enhance his outstanding story. I do hope that the Godswar will be explored in future books, as that sounded like a really fun concept that I would be deeply interested in. Guerdon is a decent grimdark fantasy city, and it serves as the primary setting for most of the city. The city’s range of interesting and unique residence allows for a fascinating overall story and makes this a fantastic setting. I really like how the city is home to a range of competing factions, such as the Alchemists, the Church, the criminal organisation known as the Brotherhood, politicians and the city’s non-human races, each of whom have different plans for the future of the city. This is a pretty typical dark, crime-ridden fantasy city, but it works really well as a setting for this story. The author’s deep exploration of the history of his fantasy city served as a useful plot point, and I love how the city’s past came back to haunt it in a number of ways. I have to say that I was really impressed with Hanrahan’s character work within this book. The author introduces a number of amazing characters, most of whom get deep and satisfying story arcs. The main three characters are particularly great. I really liked Spar, who is not only the son of one of the city’s most famous criminals, but who is also a Stone Man. It is through this character’s eyes that we get the best view of the living hell of life as a Stone Man, as Spar is forced to deal with all the unpleasant side effects that his condition brings. At the same time he must deal with his family legacy as he fights to achieve his father’s dream of a more noble Brotherhood while forced to work for its current corrupt leader. Rat the ghoul is another interesting character. As a ghoul, he is generally supposed to live under the city, but he likes living above the streets with his friends. Rat is constantly conflicted between loyalty to his friends and to his race’s ancient promises, as well as dislike for the traditional ghoul lifestyle. Finally, there is the mysterious young thief, Cari, who holds a dark secret in her past. Cari is a rebellious young female protagonist who is developing strange new powers. The exploration of her past and her abilities is a key part of the book and a good basis for a large portion of this plot. I liked the way that these three characters cared for each other and how their stories remain interconnected even as they have their own unique adventures within the story. While these three main characters serve as an extremely powerful narrative base for The Gutter Prayer, the author also focuses on a couple of additional point-of-view characters, including the veteran thief-taker, Jere; Cari’s cousin, Eladora; and the saint of the Kept Gods, Arla. These characters do not get as large a focus as the book’s three main characters, but their parts of the book are quite significant. Each of them also has a full character arc within the book, and they all develop or change in substantial ways. Jere is a grizzled private investigator obsessed with taking down the Brotherhood, and his investigations for the first two-thirds of the book provide the reader with some vital plot detail. I really liked the end to Jere’s character arc, which was both dark and satisfying. Eladora is a sheltered scholar who gets a rather rude awakening about life throughout the course of this book. Eladora is not my favourite character, but I did like her gradual transformation from damsel in distress to something more useful. Finally, there is Arla, who would have to be my favourite side character. Arla is a saint of the Kept Gods blessed with fiery powers as a result. Arla is a badass and entertaining character who spends most of the book fighting her opponents with her fiery sword and generally not acting in a way most people would consider saint-like. I especially love when she utilises her god-empowered voice to command people, as she is usually swearing while doing this. This comes up in the text in all caps, and you have to imagine it sounds pretty impressive in this book’s audiobook format. There were a number of other entertaining side or minor characters throughout the book that the author put to good use, and I will enjoy seeing what role they will play in any future books in the series. Overall, I truly enjoyed The Gutter Prayer and was impressed by Hanrahan’s magnificent debut. This was an excellent piece of grimdark fantasy which expertly combined some very inventive fantasy elements together with a fantastic story and some excellent characters. With this first book Hanrahan has shown some incredible talent as a fantasy storyteller whose outstanding imagination is his biggest asset. This is a highly recommended book which lives up to the substantial hype surrounding it. I am already extremely keen for any additional books in the Black Iron Legacy, especially as the interview at the end of the book implies that Hanrahan has some brilliant ideas for the rest of the series.